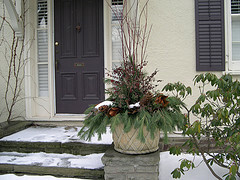 In the North and Midwest where winter is harsh, it is nice to have something beautiful and colorful in front entry pots. And why not out on the deck or any other place easily seen from inside your home? Even fallen snow on your winter potscape will add to the beauty. Create an arrangement by placing evergreen boughs, branches, and dried flower stalks into the soil of your summer pots. 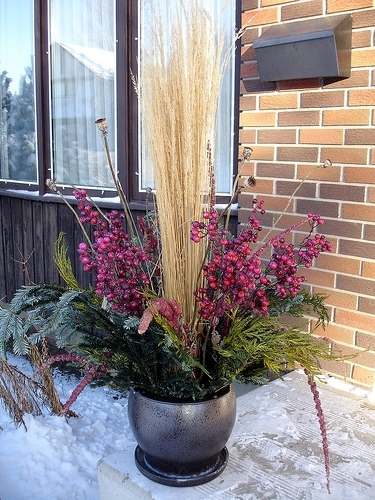 Make sure the containers you use will withstand frigid winter weather. Even though you won’t be watering containers of cut boughs and branches, the soil will be full of moisture which will expand when frozen. Stone, ceramic and terra cotta containers may crack and split. Wood, metal and resin containers are durable and weather resistant.